Schneider’s Dry Carpet Cleaning is your premier source for quick, safe and thorough floor cleaning. My unique cleaning method uses organic products to efficiently clean your floors—with no messy residues left behind. Plus, it’s dry before I leave! Call today for a free estimate. Schneider’s Dry Carpet Cleaning has been providing homes and business owners top-quality carpet cleaning in Santa Maria, CA since 1985. In the many years since I started my business, I have built a reputation on quality work, using industry-leading products that produce impeccable results. My methods ensure safe cleaning for carpets, area rugs, oriental rugs, hardwood floors, tile and grout, among other surfaces. I have developed a technique for dry cleaning that involves powder and spray, created with my own personal organic formula. These products are humane, safe and will not ruin any hardwood flooring underneath your carpet. Plus, there’s no mess! With over 30 years of experience in the industry, I have the proper tools and knowledge to get the job done right. Clients love my specialty carpet cleaning services in Santa Maria, CA for their convenience, effectiveness and reasonable rates. I do everything from whole-house floor cleaning, to detailed spot cleaning. For tough stains, my custom spot cleaner can’t be beat. For room cleanings, I can easily work around furniture and clean area rugs in place, even over hardwood floors. If you spend more than ten minutes generally cleaning your floors or carpets, you’re doing too much. Contact me today for a free estimate on carpet cleaning in Santa Maria, CA and join the long list of satisfied customers who have experienced the freshest, cleanest carpets after calling me! I’m proud to serve local-area customers and take pride in being a small business owner. With experience dating back to 1985, I take pride in bringing 30 years of expertise to every job. 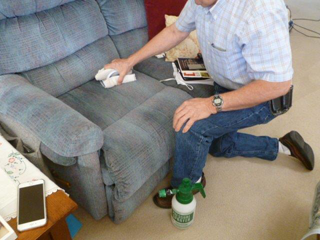 I use only safe, organic powders and sprays that leave your carpets clean and dry. Contact me for free estimates on any and all cleaning. I’m happy to provide estimates upfront.